Polaroid has been licensing their brand to a tablet maker since January 2012 (it was one of the surprise reveals at CES that year). Every year that tablet maker, the Brooklyn-based Southern Telecom, has quietly released a number of new models, including 2 kid's tablets which shipped in 2013. I have the second gen kid's tablet. The Polaroid Kids Tablet 2 (or Kid's Tablet HD) launched in November 2013, and I received this free review unit from Polaroid's pr firm in late January, when the tablet was retailing for $99. The Kids Tablet 2 is larger and thicker than your average 7" Android tablet. It's encased in a rugged white shell, with bright orange/blue/purple rubber trim around the rim. The rear of the shell is white with 2 colored ridges placed in order to make the tablet easier to grip with small hands. Along with the 2MP camera on the back, there's a VGA resolution camera on the front. Along the bottom edge of the tablet are the SD card slot, microUSB port, headphone jack, and a safe switch which disables the screen. You'll also find a pair of speakers, the volume buttons, and the home, power, and back buttons on the front of the tablet. This tablet is larger and thicker, and it also weighs more - and with good reason. It's quite sturdy, and it repeatedly survived being used as a frisbee (if you saw the dents in my walls you'd know I'm not kidding). I did notice while testing the tablet that the shell sometimes popped apart under enough pressure, but that's okay. Most tablets would have cracked rather than split open, and since I was able to simply snap the parts back together I don't see an issue. Having the bright rubber trim on the edges has rendered this tablet far more sturdy than most, but I'm not sure if the rest of the design meets the same standard. I have serious concerns about the ports and card slot being exposed on the bottom edge; they really should have been protected by rubber caps. The SD card slot in particular needs a cap; one good drop could send the card flying, and there's a good chance it too could be damaged (or even worse, lost). And there were even times where the rugged shell got in the way. When using the onscreen keyboard, for example, I often found it difficult to press the screen anywhere near the edge. I'm fairly certain that this is the case getting in the way, and not a touchscreen issue, because I encountered this issue a number of times. All in all the rugged design had its pluses and minuses, but at the very least it it was sturdy. Like most budget seven inch tablets on the market, the screen resolution on the Kids Tablet 2 is 1024 x 600, and it has a capacitive touchscreen. I would rate the screen as B-. The colors are reasonably strong and sharp, but there are some issues with the viewing angle. The touchscreen is uniformly responsive, and while the backlight is bright enough to double as a flashlight when dialed up to maximum brightness when it's set to the minimum setting it's still rather bright. When held in landscape mode, the screen on this tablet has a wide viewing angle to the left and right, but not vertically. When I rotated the upper edge of the tablet towards or away from me, the color quality drops off dramatically. I could still make out most of the details, but it's not ideal. This is a 7" tablet, so I would expect that most people are going to see it a personal tablet which is not intended to be used by several kids at once. The screen is too small for that, really, so the issues with the viewing angle are probably never going to be an problem. This being a kids tablet, I don't expect that you''ll really be using the cameras much. 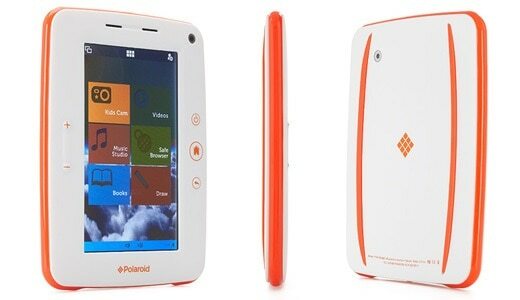 It has 2 cameras, a VGA webcam on the front and a 2MP camera on the rear. Both are quite good, and they take a higher quality photo than cameras on most of the tablets in this price range. The camera app comes up a little short, though; the Kids Tablet 2 has the standard basic camera app for Android and it even has a simpler app for children to use, but like many camera apps on Android tablets only a limited number of options and features. Normally I wouldn't comment, but the cameras on this tablet are better than most and they could benefit from a better camera app. Here are a couple photos I took with the rear camera. They're not great, but I've seen worse from similarly priced tablets. I ran my usual battery life test, twice, and I would estimate that the battery is good for between 3 and 4 hours of video watching. If you turn off the Wifi and turn down the screen brightness, you should be able to stretch the battery life even further. Three and a half hours of battery life is about par for $99 budget tablets, but it's not as good as some. The HP Mesquite, for example, rated at an estimated 5 hours of battery life. That tablet isn't nearly as rugged nor does it have good cameras, but it does offer the best battery life in this price range. This is probably the one area where the Kids Tablet 2 really shines. This tablet doesn't ship with Google play, which is a serious shortcoming in my eyes, but it does come with a suite of kid-safe games to play. To start, the home screen on the Kids Tablet 2 offers a simple and easy to understand interface. Kids have immediate access to a kid-safe web browser, a camera app, safe sources of streaming video (Cartoon Network, etc), ebook apps, games, and educational apps. Among the many games, the tablet ships with an Arcade app with 30 simple games, including a number of games that are supposed to be educational. I'm not sure that's true, but I won't quibble. And the Learn & Play app contains basic activities like Connect the Dots and Memory Match, while the Talking Ginger app allows tykes to interact with a virtual cat. It also ships with a number of apps from Disney and their subsidiaries (Marvel and Pixar). Some of the Disney apps are games based on the various Disney movies, but other apps are ebook apps. Kids can have the apps read stories to them about Disney characters like Cars, Marvel's Avenger comics, and more. The apps offer 6 language choices, including German, English, French, Danish, Spanish, and Italian. If not for the language options I would say that the ebook apps are of questionable educational or literary value, but they should prove diverting on a long car trip. And if kids aren't interested in being read to, the ebook apps include mini-games. Parents can also add new apps and games to the tablet via the parental controls. This is password protected, of course, and you'll need to set it up before handing the tablet over to the kid. When the tablet is in parent mode it's pretty much like any other Android tablet, albeit with an unusual interface. You can decide which apps are accessible to the kids, or use the tablet yourself. Now, there's no Google Play, but the Kids Tablet 2 does ship with a proprietary app store with dozens of free and paid apps sorted by genre and age range, and it offers a list of suggested app stores which can be installed, including the Amazon Appstore, 1Mobile Market, GetJar, Opera 12, and SlideME Market. Aside from Amazon, all of the listed app stores offer free software (but sometimes ad-supported) that does not require credit card information. As I pointed out in the previous section, this tablet ships with a great selection of kid-safe content. There are ebooks, apps, games, and other activities, all of which meet my non-parent standards as being safe for kids. But before you rush out and buy this tablet, I wanted to add one caveat. Yes, this content is kid-safe, but in a number of places it is also wrapped in ads. I was browsing the videos available via Cartoon Network when I discovered that the free clips they offered also had pre-roll ads. I can't say for sure where the ads are going to pop up, so caution is in order. If I were a parent who wanted to keep my kids from seeing commercial television, the ads would bother me. I would want to check to see which apps and websites have ads, and probably block access. But that's just me; your rules are probably different. I can't say that this tablet impressed me in any way, but I also wasn't disappointed. With an Antutu benchmark score of 11276, the Kids Tablet 2 tested lower than most of the budget tablets I've tried in the past 6 months. The benchmark app listed the RAM, storage, and most other aspects of its performance as average, and it also noted that the CPU was underpowered and would not be capable of running large apps smoothly. That doesn't match with my experience using the tablet. I mainly used it to play the included games and watch the occasional video, but I didn't have any issues. I also didn't have any trouble browsing the web. I have mixed feeling about this tablet. On the one hand, I'm irritated by the colors used in the interface and by the lack of Google Play. On the other hand, when viewed point by point this is not a bad tablet. It has a ruggedized shell, reasonable performance and battery life, good cameras, and front-facing speakers (a rarity on premium tablets, much less $99 budget tablets). On the gripping hand, the speakers are quiet, the card slot is poorly placed, and the lack of Google Play is (for me, at least) an important omission. I tend to think that child-proofing your old tablet is a better value, but if you are set on buying a kid's tablet, this would not be a terrible choice. At this time I have only been able to find the tablet at one retailer. While it is also listed on Amazon, the seller is asking $599, which is simply crazy.